This is a really neat train ride. I really liked the cars and how they mostly enclosed. It gave a fairly good tour of the park in areas that you can't reach on foot. Zephyr is a good ride, and it certainly holds some historical significance in Dorney. This ride looks unique compared to some other parks train rides, and although there isnt a ton of head room for taller riders, it is still in good condition and has obviously been taken care of by the park. The rides course is fairly decent, especially the part by/along the stream. Hopefully the more lackluster portion that previously gave a stunning view of parked cars will be livelier with the addition of VooDoo, which is right alongside the Zephyrs track. Simply put, this is a good train, and its a ride that kids surely would enjoy, while offering adults a relaxing ride and a fun change of pace from the parks thrills. Well, its a classic, but honestly I came off really disappointed. The train is a beauty and a rarity at the same time. 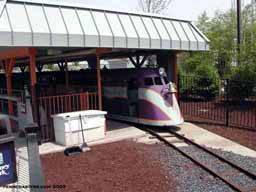 Im glad that Dorney has kept this train around and it seems to be in great condition too, so congrats to them. However, the train just didnt ride well. Throughout the whole ride, the train made a very loud and annoying screeching noise due to the rides age. Looking past that, the track only covers a small portion of the park and passes by only a few rides and the parking lot. I mean the views might not be too bad if it werent for the tiny windows which really prevented me from seeing a lot of the sights clearly. Finally, the train was also just too slow for my taste. Its a good way to see the park and a good way to relax and rest your feet. It is great to see this thing here since it saved Dorney. It stinks that they re-routed the track though and the first half of the ride has a wonderful view of........ the parking lot. But riding through the woods and next to the stream is a lot of fun. Its cool that your closed in like a real train. Its fun to just relax on and see some o the sites. This ride gets a higher then normal rating for a train ride from me due to its historical significance to Dorney Park. This is the ride that saved Dorney Park in the depression, and I am happy Cedar Fair has not removed it over the years. During the time of the depression, people were looking for something to bring their spirits up, to give them hope. Burlington Lines had introduced a new streamlined train called the Zephr that created a nationwide sensation. Dorney Park relized that they needed something or the park would go under, so they introduced their own minature version of the Zephr. The train is also unique in that it has a gas engine that actually powers electric motors between the cars.